I’ve mentioned before, but if I’m sharing a recipe here on my side of TIDBITS, it’s because I’m pretty excited about it or I’ve had a special request. In this case, I’m sharing for both those reasons. In addition, my wonderful friend Krista from The Happy Housie has arranged a Summer series called “Seasonal Simplicity”, and today my friends and I are bringing you simple recipes perfect for Summer time. I’ve also joined in on the Seasonal Summer Craft/DIY Ideas and Summer Wreaths. 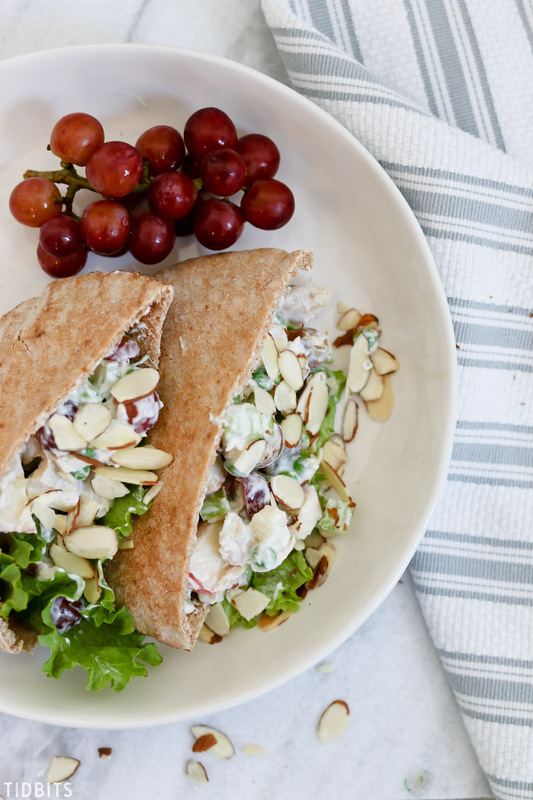 Be sure to make it to the bottom of this post to explore all the Summer Recipes available for you today. 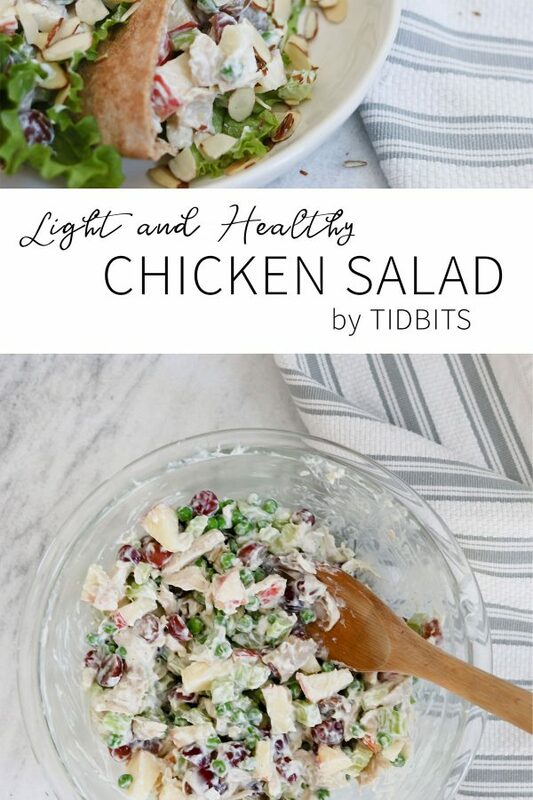 Now let’s talk about this light and healthy Chicken Salad Recipe. 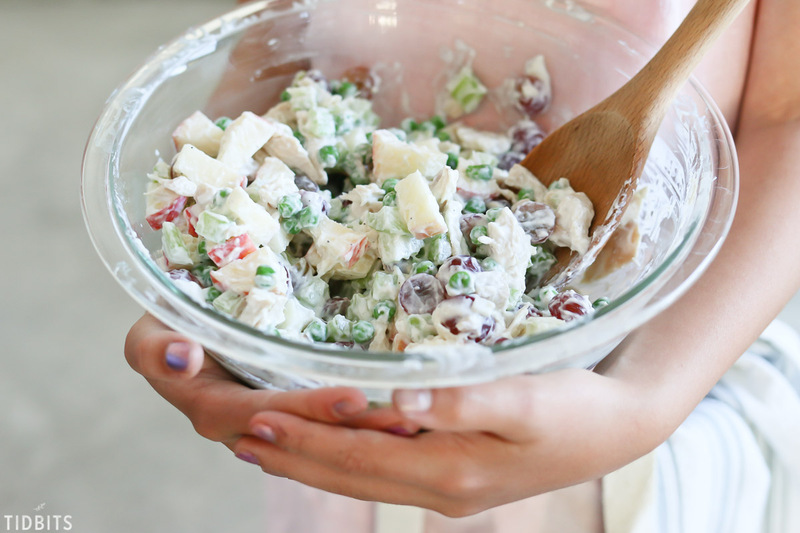 It is a Summer staple for me because it is so easy to whip up, so fresh and delicious, and I can make it ahead of time and have it as leftover lunches for my husband and I for a few days. I’ll be as happy as a clam eating it by the spoonfuls or wrapped up in a whole wheat pita or tortilla. Equally yummy on a croissant, just not as good for you. We’ve packed it on road trips and picnics, and it leaves me feeling oh-so-good because of all these fresh ingredients. 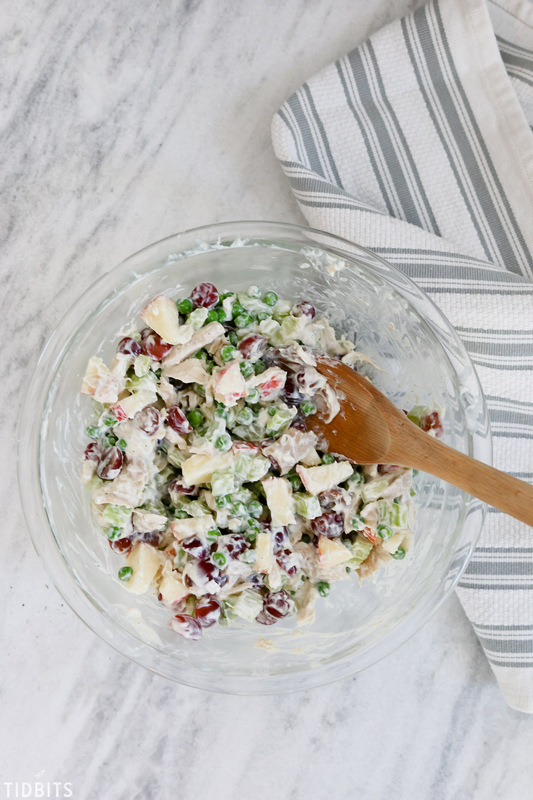 I throw in 1 cup of all the things – diced apples, celery, peas, grapes, and cooked diced chicken. The key to making this really simple is using a rotisserie chicken from the market, or if you prefer more organic meats, cook and shred them ahead of time and keep them in the freezer. 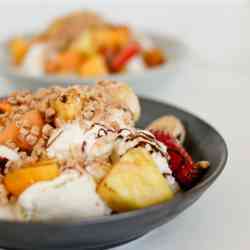 Those ingredients are the base of the salad, but you can add garnishes when you serve to add to the taste and texture. Foods such as nuts, cranberries, lettuce, diced avocado . . . or whatever you can imagine. Just be sure to add the nuts when serving, otherwise they risk going mushy as leftovers. 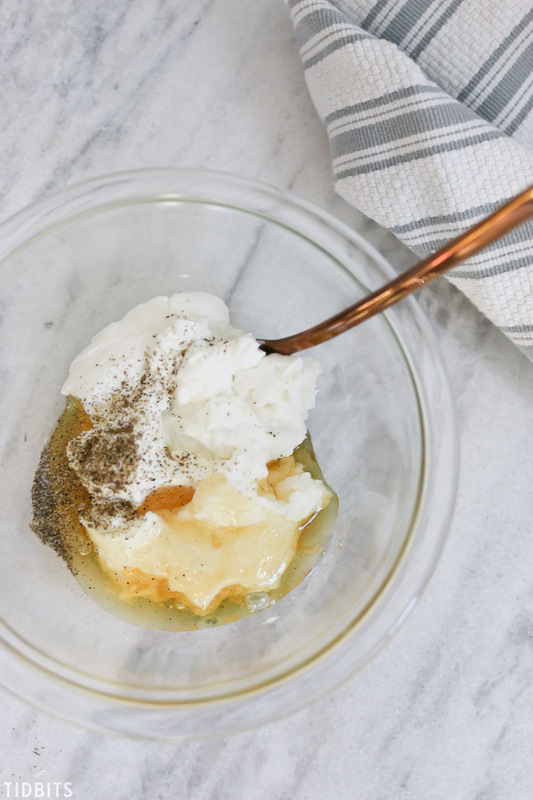 The dressing for this recipe is what brings it all together, while packing in more protein and probiotics. It is simply plain yogurt with a drizzle of honey and sprinkled with salt and pepper. Feel free to use Greek or Homemade Yogurt. Once that is all mixed together, it’s ready to be garnished and guilt-free devoured! A delicious meal any time of the day, without heating up the house with the oven. I shared this recipe on my Instagram stories when I was talking about fast and good-for-you lunches for the busy mama. That’s when I had many requests to get this recipe posted. If you’de like to see the other lunches I make up for myself when I’m in a hurry, check out my Instagram Story Highlights, where I have them all saved. I’d love to hear what are some of your favorite recipes during the Summer time. Hit me with your best! Thanks for reading my dear friends! 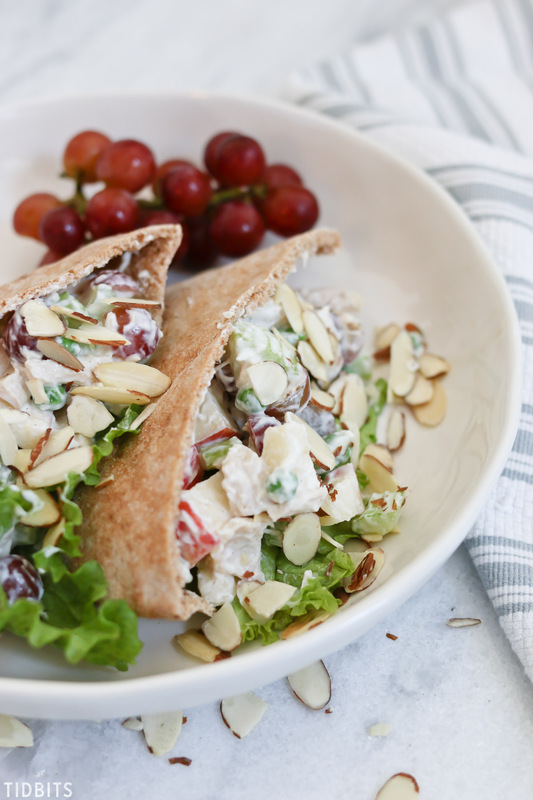 You won't miss the mayo in this better-for-you version of healthy Chicken Salad Recipe with yogurt dressing. Nuts - pecans, sliced almonds, walnuts, cashews, peanuts, etc. 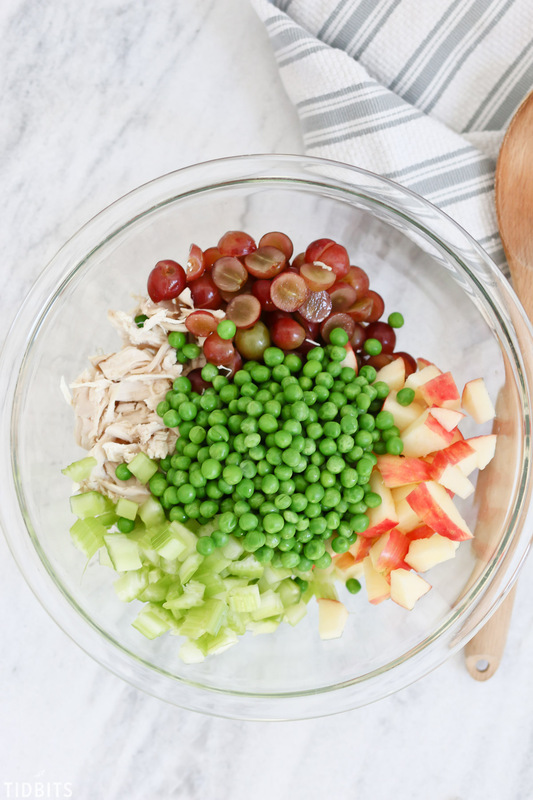 In a large bowl, mix together the chicken, grapes, celery, peas and apples into a bowl. Mix together the dressing ingredients in a separate bowl. Pour the dressing onto all the salad ingredients and mix to combine. Serve with garnishes. 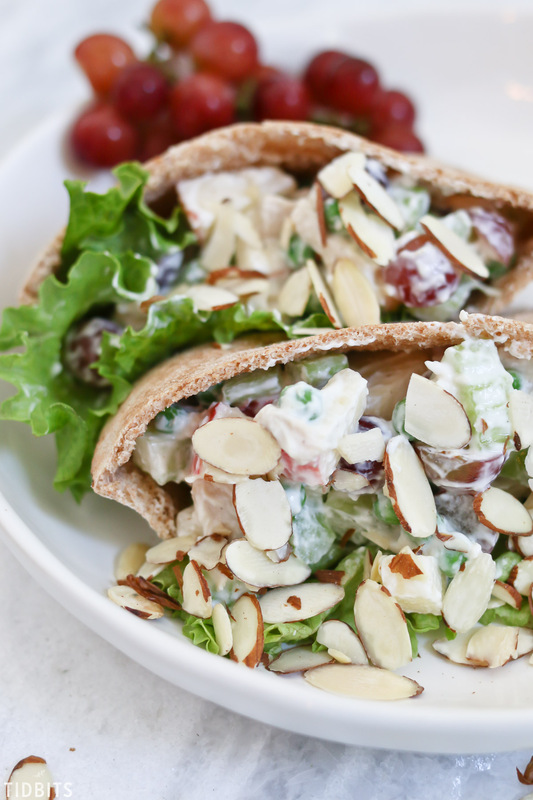 Eat plain or wrapped inside a pita, tortilla or croissant. This looks so yummy and crunchy and I love the lightened down version! 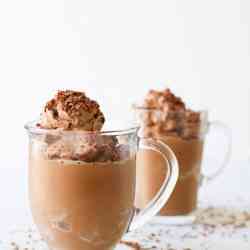 Thanks for sharing the recipe – pinned so I can try it! And thanks for joining me on this hop, Cami! Looking forward to trying this! What kind of peas do you use? I love fresh peas but only get them for a few weeks each summer. 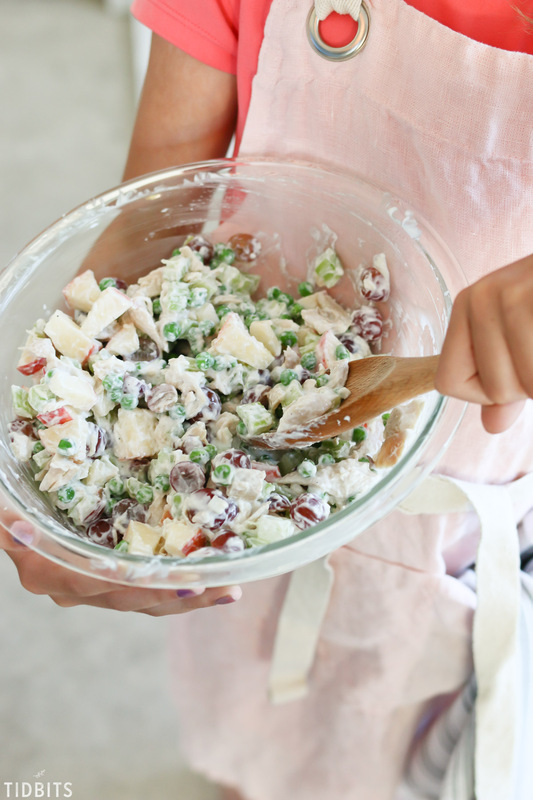 I have made a lot of chicken salad but never with sweet peas or yogurt, so i need to try this recipe, thanks. Oh, wow. Looks amazing. I wouldn’t have thought of mixing peas in but I bet they taste amazing in it.